Our Models - Their stories inspire everything we do! Dogonfunny® models are rescues. Some were strays, some were puppy mill survivors, others were given up by their owners or simply abandoned and left to live or die without a second thought. In many cases, animal rescue groups were the first on the scene to save their lives. After the initial rescue, these animals depend on the good people who wish to give them a second chance in loving homes. These are there stories. Links to the rescue groups mentioned can be found under Rescue Organization Links, found under the About tab on every page. Ollie, our logo model, was one of our earliest rescues and the inspiration for Dogonfunny®. We first spotted him on a beautiful fall day at Baltimore's Inner Harbor as we sat on a balcony overlooking the water. He was a scruffy little thing, sitting at the edge of the crowd below. He seemed at home in that spot as he opened his mouth in a gigantic yawn and then hung his tongue out with a goofy grin. Everyone ignored him as they watched the street performers juggling on their unicycles, but we decided to go and see if we could pet him - assuming he was with someone. Surprisingly, no one claimed him or knew where he belonged. Some of the regular visitors from the area said that they had seen him hanging around before and that he was a stray. The little guy seemed curious and friendly and we thought he might be a terrier mix - we knew he would be going home with us almost immediately. He was skinny and quite weak, but the little year-old pup charmed us as he meekly allowed Bill to carry him to our car. Even in his poor condition, his special personality came right through! Angel is our own rescued pup. We adopted her 9 years ago in Maryland from a group of volunteers who routinely visited the county shelter (a kill shelter) to pick up dogs and cats to re-home. Originally, Angel had been purchased at a pet store and given as a surprise Christmas gift to a young family with 3 small children and 2 working parents (obviously a bad idea all around). Only 8 months later, the father turned her in to the county shelter while the mother took the kids on a trip. Once the volunteers rescued her, she was adopted from them for ONE day and then returned for having an accident on the rug. Well, their loss was our gain. Angel is lively, funny, and entirely unique. She has been a wonderful big sister and part mom to our newest rescue, Patch. This is our boy, Snoopy. We found him - just like Patch (below) and Ollie. Snoopy was wandering on a rural road not far from our house before we relocated to Kanab, UT. We were on our way home from our auto mechanic's garage on a cold February evening and we spotted him limping along. When we stopped, he came to us with only a little coaxing. He looked so very small and one of his eyes was blue. I thought that he may have been blind in that eye. We already had Ollie and another rescue named Ben, so we figured we would take him home and bring him to Animal Rescue in the morning. He was filthy and smelled of manure, so he needed a bath. He was so incredibly cute and sweet that we immediately decided to keep him. As it turned out, Snoopy was about one year old, never neutered, terribly malnourished and infested with worms. He had been limping because his feet were swollen from so much walking. He also was not blind in his blue eye - just a very unusual beagle. There are so many stories about Snoopy because he was the sweetest, most lovable and funniest dog ever. This is also our pup, Patch. We found her abandoned on the side of a remote but busy highway leading from Arizona into New Mexico as we were nearing our first destination on a 9 day trip. Her back left leg had been horribly injured, probably by an animal attack. She was only about 6-8 weeks old, yet she seemed in fairly good condition otherwise. As a matter of fact, we had no idea her leg had a compound fracture because she was so stoic and cried only for food and water, which she eagerly accepted. The closest animal hospital was 35 miles away, but they were able to see her immediately. Sadly, the vet said that Patch’s leg couldn't be saved, but she assured us that most dogs, especially puppies, could do quite well with three legs. We had already decided that we would be adopting Patch provided that she and our dog, Angel, could get along. We made arrangements for her surgery and subsequent care until we could pick her up to bring her home. We needn't have worried about Angel, who took to her immediately and acted like we brought her the best gift ever. Patch runs around as if she is unaware of her missing leg. Please do not hesitate to adopt a special needs pet if you are able. We feel so lucky to have found Patch and her loving devotion has already convinced us that she was meant to join our family. 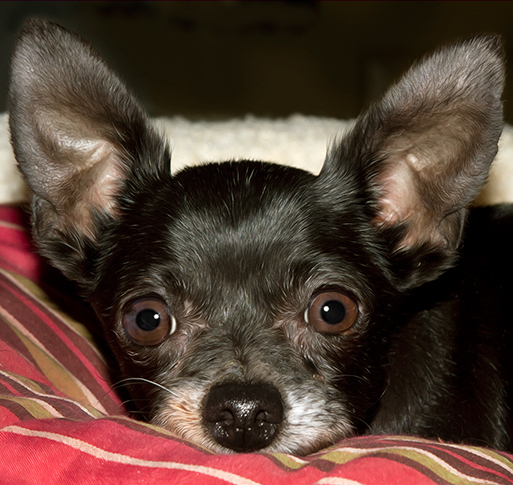 Pearl is a sweet and loving Chihuahua who was rescued in 2013 after being abandoned under a bridge in Arkansas, along with many other horribly neglected dogs, simply because they were no longer profitable to the puppy mill where they had spent their lives. She was one of only 3 dogs to survive this ordeal and yet she herself was so sick that her initial rescuers reluctantly considered euthanasia. Luckily, the founder of National Mill Dog Rescue, where she was taken, wanted to give her a chance even though Pearl was about 13 years old, had a severely infected mouth and was very malnourished. The treatment of animals in puppy mills is cruel beyond belief. Breeder dogs spend many miserable years in cramped, filthy cages, breeding without any recovery time, and without receiving proper food, clean water, health care or exercise. Ironically, the produced puppies command exorbitant prices and are misrepresented online and in pet stores as pups who have come from reputable breeders. After Pearl spent a few months at NMDR, Kim, who has rescued animals for more than 20 years and who often travels to Colorado to volunteer with this wonderful organization, was asked to take Pearl. Most puppy mill survivors are at first fearful of human interaction, but they can be rehabilitated with loving patience and care. Pearl has adapted amazingly well to her fantastic new life. She has a large family of rescued buddies and a mom who takes her to work and everywhere else! Puppy mills can be stopped by educating the public to never buy pets that are sold in pet stores or on the Internet. Breed rescues are a way you can adopt a specific breed and still save a life.